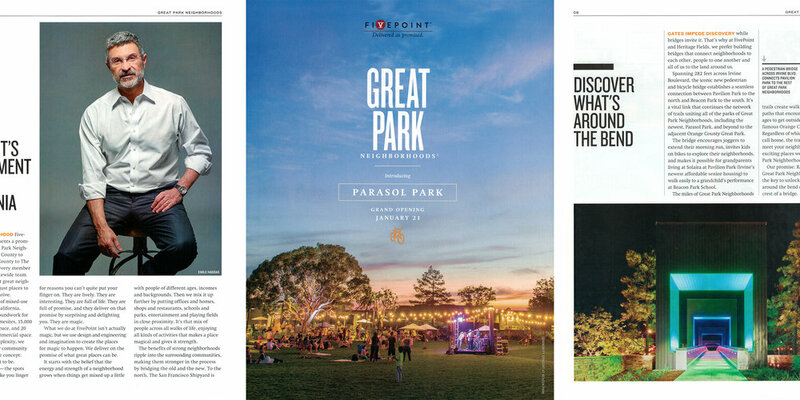 Tsutsumida Pictures provided key photographic content for the Parasol Park community magazine which was launched in the Orange County Register and is currently distributed at the sales center. Scope of work included architectural photography, lifestyle photography, event photography, and corporate portraiture. Editorial story about the Ecology Center at Parasol Park. Featured in AAA's Orange County Westways Magazine. Tsutsumida Pictures provided key photographic content for the Beacon Park community magazine which was launched in the Orange County Register and distributed at the sales center. Scope of work included architectural photography, lifestyle photography, event photography, and corporate portraiture. Community awareness marketing campaign and brochure for Great Park Neighborhoods. Interview with tether tools about equipment solutions for architectural photography. Editorial feature and instructional tutorial on Totally Rad. Damian Tsutsumida was interviewed by Shutterbug Magazine for an editorial feature on photography business practices.